Carlow College, St. Patrick’s is committed to developing and maintaining a governance and organisational structure that is effective, flexible, sustainable, transparent and viable. 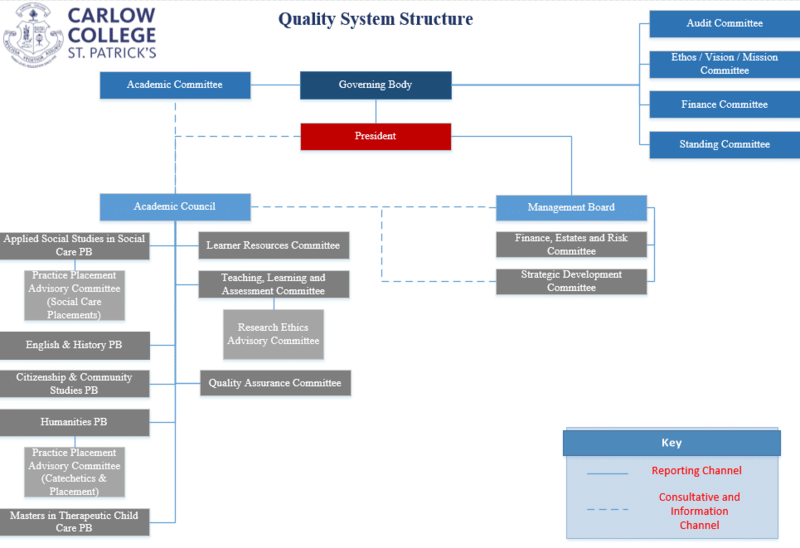 This commitment is outlined in the College’s Strategic Plan 2017 – 2022 whereby the following goals, in relation to governance and organisational structure, are prioritised: reviewing and monitoring on a continuous basis the effectiveness of organisational structures and processes within the College; outlining and revising key areas of accountability, roles and line management functions; continuing the development of a robust quality assurance system to inform and support governance and organisational structures; and ensuring that strategic targets set for the College have built-in mechanisms for monitoring their effectiveness. The governance of Carlow College is managed by the Governing Body in accordance with the Instrument of Governance signed 22 November 2016. Their role is, in an overall capacity, to provide strategic guidance and to monitor the activities and effectiveness of the management of Carlow College; additionally, the Governing Body also has a statutory requirement to ensure that the charitable mission of the College is safeguarded and carried out in accordance with the Charities Act 2009. The Governing Body constructively supports the President and the two decision-making bodies within the College, the Management Board and Academic Council. 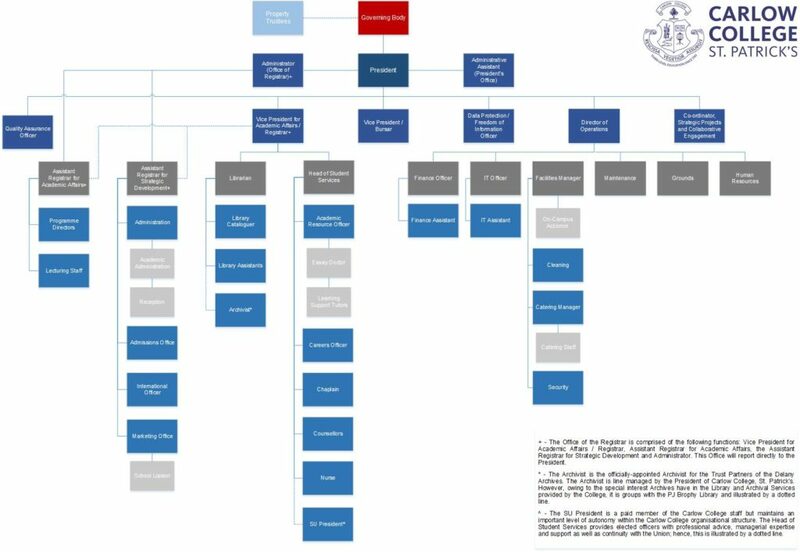 Both the Management Board and the Academic Council have reporting committees that have defined responsibilities which are published in their terms of references.